I've got a special code at the bottom of this post, so make sure you read to the end! 💙 And thank you to everyone who reached out about yesterday's post; you've truly blessed us! I am obsessed with using a planner. It has to be a paper planner, too, because I've tried using the calendar on my phone and that won't cut it. My planner obsession all started back in the sixth grade when we were required to buy a planner and write our homework assignments down in them in each class. I specifically remember having planner checks in my English class to make sure we were writing each day's homework assignment down (and I always got a 100 on those....of course, right ha!). When I graduated from Alabama and moved back home, I had to find a new planner. I can be pretty brand loyal, so once I find a planner I love, I stick with it and I don't ever change. I was loyal to Erin Condren for YEARS. It was the best planner I could find, but it still didn't meet my needs. 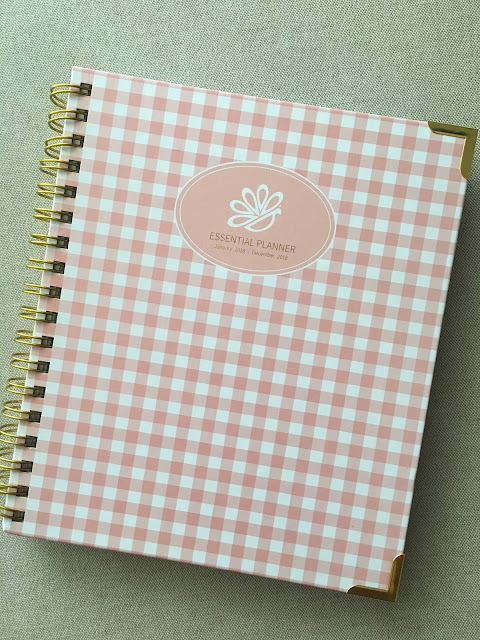 When my friend Kelsey contacted me with her idea of starting a planner business and asked for some ideas, I told her everything I wished the Erin Condren would have. I used a weekly edition of the Erin Condren because my days aren't so crazy that I don't need to plan out each hour of my day. But some things that the EC lacked, in my opinion, had to do with meal planning. I try to eat and cook as healthy as possible, so in the EC I had to find a random spot and write that day's meal down. It worked but I wasn't totally happy with it. When I got The Essential Planner in the mail a few days ago and flipped through it, it was even better than I could imagine! It's like Kelsey knew everything I needed and put it in one planner. And the best part? 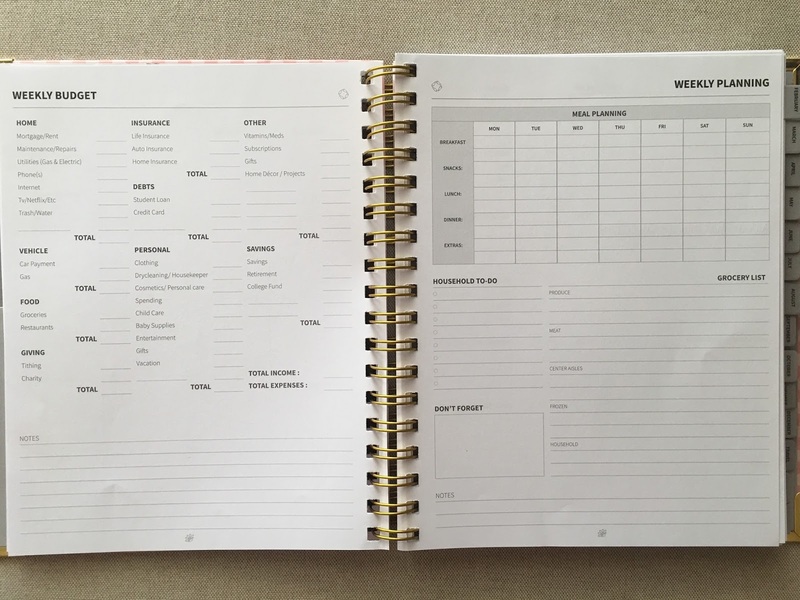 The quality is top-notch and much cheaper than EC planners! 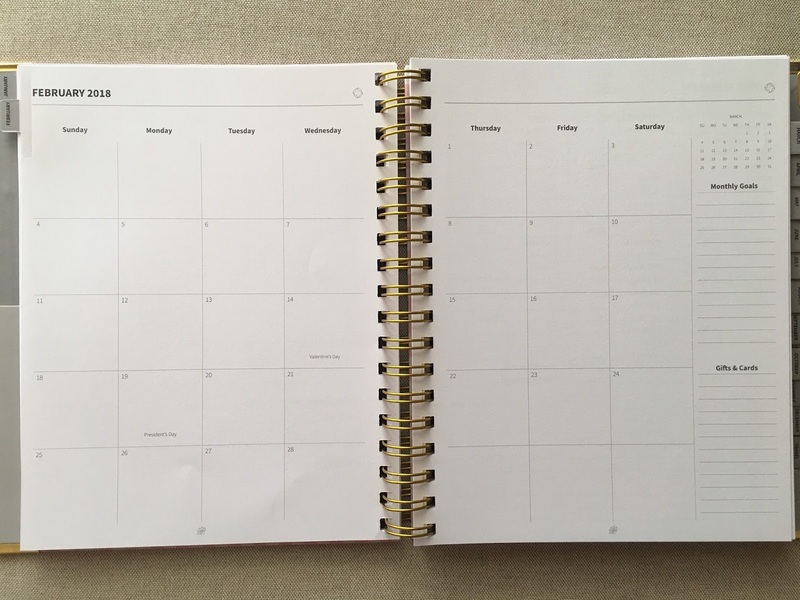 Each month begins with an overview like most calendars, but if you notice the right side, she's given you space to list goals for the month and any reminders you may need to buy anyone a present or send a special card! Before you open to each week (which is the next picture), you get an overview of your weekly budget. This is more Dustin's forte than mine, but hopefully this will help me have more of a part in our budgeting instead of just knowing how much I have to spend on myself ha! The right side is my absolute favorite!!! She's given a space to plan out each meal if needed and also given an area to make your grocery list!!!! Y'all, this is before each week so if you're a weekly grocery shopper like me, this is amazing! No longer will I have to keep up with a piece of random paper, but I've got it in my planner! Woohoo! This is what each week looks like. 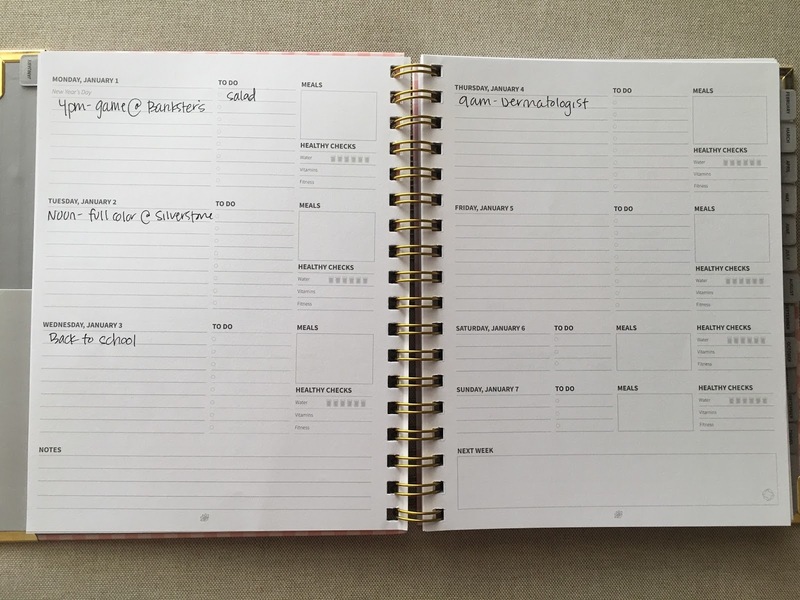 You'll notice that you also have an area to jot down any meals if you want to plan that way or if you're keeping track of eating healthy #newyearresolutionanybody? You can also schedule in your exercise and keep track of your water intake if you need that encouragement and accountability. The exciting thing for today?? I'VE GOT A SPECIAL DISCOUNT CODE FOR Y'ALL!!! At checkout, you can use the code SHANEYFELT20 for 20% off your purchase! It's not too late to order one because shipping is fast, so I encourage you to head to her website to order yours now! This is the blush gingham weekly planner that I have. A huge thank you to Peacock Paper & Gifts for sponsoring today's post. All opinions are my own. I'm not going to sugar coat it--2017 was a tough year for us. Last December I had surgery and discovered that I had severe endometriosis. So severe that my doctor also had to remove my appendix before it ruptured from all the endometriosis. I also found out that IVF would be our highest chance of being able to get pregnant. So starting 2017 was sad, but after much prayer, I was ready to do whatever it would take to have a baby. 2017 marked three rounds of IVF meds. During the first round at the beginning of May, I had to stop after day eight because my body wasn't responding. We were able to fully complete the second round and go through with a fresh transfer in July. I started bleeding on our anniversary and our loss was confirmed the next day at the doctor. You can read about that here. July 18, 2017--pregnant for the first time with twins! 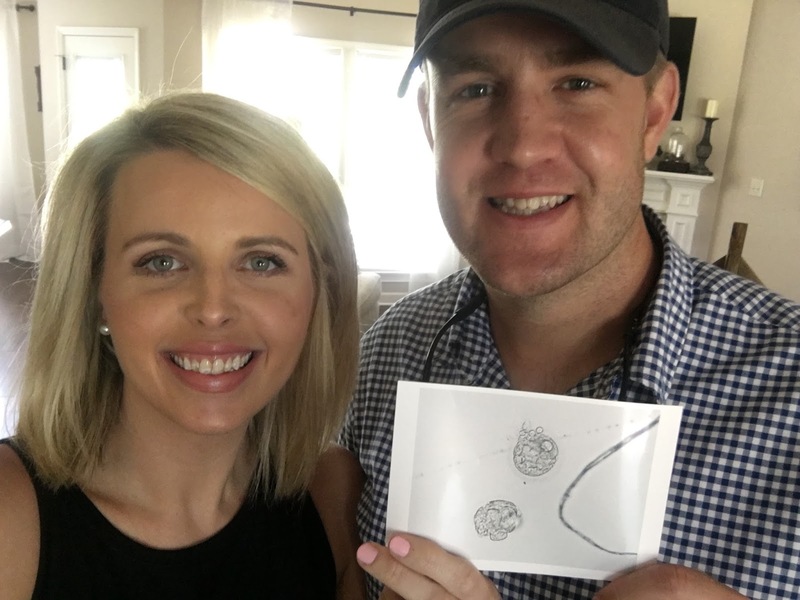 I went through a third round of IVF meds in October and instead of having a fresh transfer, we opted to have our embryos frozen so I could give my body time to fully recover. For those of you who have never gone through an egg retrieval, it's pretty rough on your body. I remembered how sore and swollen I still was during our transfer in July, so I felt like it would be so much better to let my body rest and recover. Our next transfer was December 13. We didn't tell too many people because even though we covet everyone's prayers, this is a hard situation emotionally to walk through. I was terrified of losing these babies and then having to tell everyone. I needed to be able to protect my heart and wanted to share our news (hopefully good news) in our own time. This time was different than the last. When you deal with fertility issues, I've found that you become really in tune with your body. I had cramping two days but we hoped and prayed it was just implantation. I went for my blood test the Friday before Christmas and the nurse called me a few hours later with the news....I wasn't pregnant any longer. I don't know if it's just me or Christians in general, but I feel guilty questioning God. I know that I should trust Him. I know that He is sovereign over everything. I know His plans are always better. But my heart questions why. Why us? Why can't we get pregnant like everyone else? Everything about this transfer was textbook perfect, and we were so very hopeful. I wrote in August about how so many of the Psalmists cry out to God in their suffering and pain, but end those same Psalms praising God for who He is--and who He is is good and just and compassionate and loving. Even though my heart still hurts and wonders why we can't have the babies we pray for and long for, the things that I know about God are sustaining me right now. John 4:24 tells us that "God is spirit, and those who worship him must worship in spirit and in truth." I know my heart will eventually accept what the Lord has given us, but right now my knowledge of who God is gives me the strength to get out of bed each morning and go throughout my day. This is why it is so important to have good theology (good and solid knowledge of God) when you go through a trial or suffering! "Trust that hope will come, and praise Him while you’re waiting. If we waited until we felt like praising God, He’d rarely receive our praise. Sometimes we must choose to praise Him even though our hearts don’t feel like it." I'm hopeful as I enter into the new year. God has given Dustin and I such a strong desire to have children that I know He will see that through one day. The waiting is hard and getting harder. But I am choosing to be hopeful this year in that maybe 2018 will be the year God blesses us with a child, and if not, I will still praise Him. My goal for this blog post is not for you to read this and think, "Man, she's got it all together" (because I don't) or "Her faith is so strong" (because it's not--it's the Holy Spirit within me). What I hope and pray that you see is God's goodness and mercy in this situation. He is my strength. He is my provider. He is my joy. So if you're going through something right now that's really hard, know that your identity isn't found in your suffering. I know that my identity isn't found in being a mother or a wife or a teacher. My identity is found in Christ. Aside from a special pre-scheduled post tomorrow, I'll be taking next week off of blogging. I've really had to step away from social media this Christmas season because selfishly, my heart hurts when I see pictures of babies or pregnancy announcements, and I really have to guard my heart right now. Thank you to everyone who has prayed for us or sent an email or note of encouragement. We appreciate every single one of you! It's the last Thursday before Christmas and I feel like Dustin and I have ALL the Christmas traditions to still do! Tonight we'll do our annual Shaneyfelt Christmas Light Drive-by and watch Home Alone. 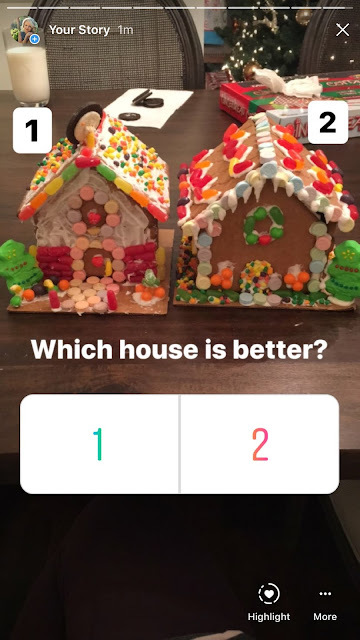 Last night we built gingerbread houses. Let me start off by saying this--we are a competitive couple. As in, we like to race to the mailbox to see who can get there first to get the mail or who can put their pillowcase on their pillow fastest. Crazy, I know, but we really enjoy competing against one another. We evenly distributed our candy. Working on getting our houses constructed first. First, please notice the icing all over Dustin...and his mouth. This type 1 diabetic should not have been eating that icing! He wins the award for messiest work space! Since Dustin and I have started dating, almost every Christmas season we've driven the 1.5-2 hour drive to Nashville to look at the lights at the Opryland Hotel. This year we started at the Opry Mills Mall for lunch--big mistake...way too crowded--and then walked over to the hotel to look at all the lights. They had changed a few things up since we had last been two years ago so it was nice seeing new things. You know there are always lots of selfies when it's just y'all two. As we were looking at the Directory in the front lobby, a couple approached us about tickets to the dinner theater show that started in 15 minutes. They had a toddler and decided they didn't want to take her into the show, so they gave us their tickets....GAVE us their tickets! I called my mom to tell her and she looked up the price of the tickets--$80 each! We could not believe it, and we are so grateful to the couple who so generously gave us their dinner tickets! We were the last two at our table and the server immediately brought us out our first course...mushroom soup with a pastry baked on top. I was too in shock to take a picture because we still couldn't believe our luck! The main course--it was so good! The dessert course was really good, too! Diamond Rio was the performer. Even though I'm not a country fan (and Dustin is--he was in heaven! ), it was a good show! They opened with some of their hits and then played Christmas songs the rest of the show. The outside lights are always my favorite, but they weren't as big this year because the hotel is adding on a water hotel. 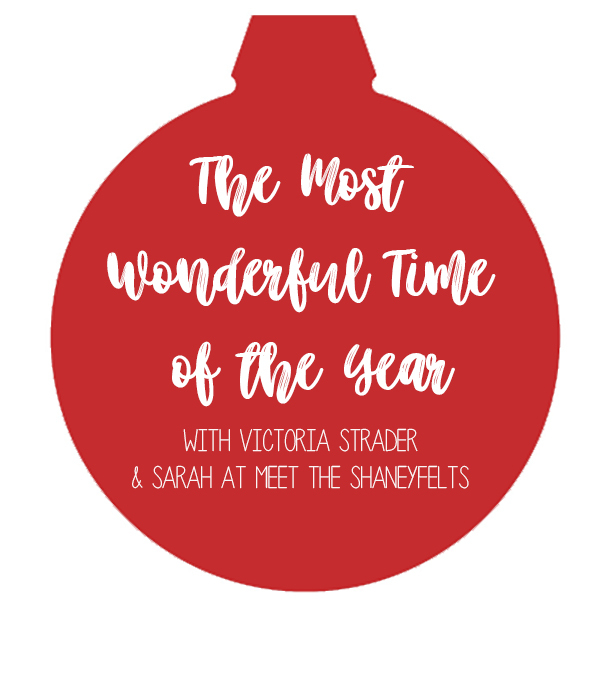 I cannot believe today is the last day of The Most Wonderful Time of the Year link up! Have y'all enjoyed this link up as much as we have? Thank you to everyone who participated! We are so very grateful! Today's topic is near and dear to both mine and Victoria's hearts. Yes, it's so fun to decorate your house for Christmas and buy gifts and make gingerbread houses and all of that stuff--but that's not what Christmas is really about. What Christmas is really about is our need for a Savior and the fact that God sent us that Savior--His Son. That's what Christmas is about. So how do I make sure that our family doesn't lose focus on the real reason for Christmas? I always do an Advent study each Advent season. In the past I've done John Piper's free studies, but lately I've been purchasing the She Reads Truth studies to do on my phone. This year Dustin bought the one from He Reads Truth and we've been discussing them each night. Last year I bought my mom Ann Voskamp's The Greatest Gift and she said she's really enjoyed it. Another great tradition that my family has done is reading the story of Jesus's birth in Luke 2. This was always done Christmas Eve night with my dad's side of the family before anyone was allowed to open Christmas presents. I love that tradition so much because it was always something I looked forward to as a child. What are some meaningful traditions you have in your family? There's nothing better than a good holiday party. I love love LOVE the thought that goes into planning and executing a party, the sweet time with friends or family, and the food! Whether you're throwing a finger foods bash or providing an entire sit down dinner, the food is important. I believe that creating a menu for your holiday party is the same--you're communicating your love through the food you serve at your holiday party. Below, I'm listing a few of my favorite go-to recipes for holiday parties, but I really lack in this area. I think because there are so many options that I have a hard time deciding what to bring or serve. This is why I cannot wait to read everyone's posts and bookmark some really good recipes to make later this month! I've made these for a few different functions and every time I do, I always get TONS of compliments and am asked for the recipe. It's the easiest thing to make (no, really, it is) and only requires 4 ingredients...that's it. SO SIMPLE! 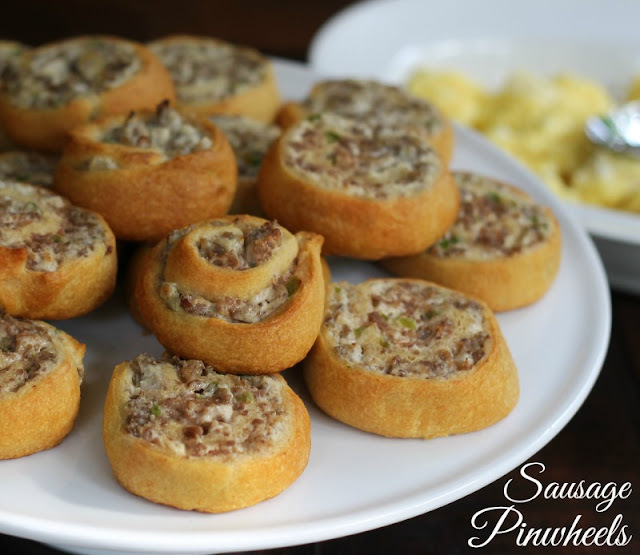 I have a brunch to attend next week and will be making these sausage pinwheels. They are a really easy finger food and can be made healthier with substitutions--reduced fat crescent rolls, turkey sausage, reduced fat cream cheese. I always make these the night before and put them in the fridge overnight. Then I slice the morning of and bake. This is a Mix and Match Mama recipe. 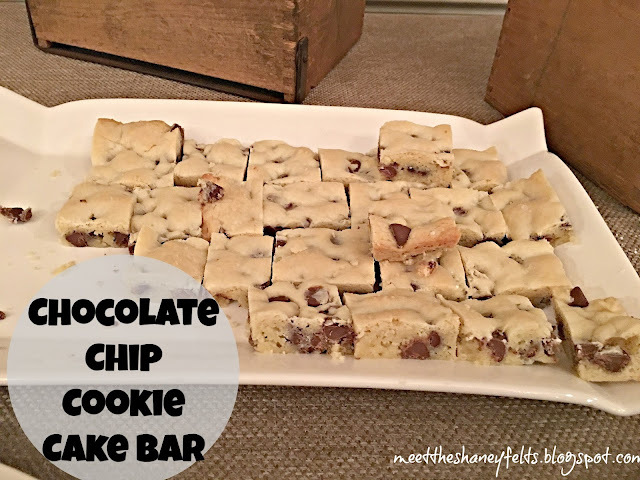 I LOVE making Shay's bars and this one might be my favorite! It tastes just like a cinnamon roll!! I've made homemade cream cheese icing before, used store-bought cream cheese icing before, and have even made a glaze for the top. They all taste good and good luck stopping after one piece haha! Now it's your turn! Link up with Shelly, our guest cohost, and I today to share your favorite holiday party recipes! **Victoria will not be able to link up today or tomorrow. We will miss her! I feel like I say this about every post this link up, but I really love today's topic. I have always loved home tours, but there's something magical about a home tour during the Christmas season....the twinkle lights, a bright Christmas tree...it's all so warm and cozy! This year I decided to tone it down a little this Christmas. I didn't put out some decorations and I moved some things around. Dustin even commented about how "toned down" our decorations looked this year, but I felt like it was a good year for change! Without further adieu, welcome to the Shaneyfelt home! I'm missing the backdrop for our nativity, but it costs $150 so that will come later ha! I did a really simple tablescape this year. I moved our tree this year, too. We've always put it in front of those back windows, but this year I wanted to try it in that spot and it worked out! I did add a little tree to the guest bath this year. A special thanks to Michaela for cohosting today's house tour post with Victoria and I! I can't wait to see everyone's homes! Today is reason #99759 that I'm thankful my sister is a photographer because she took or gorgeous Christmas card pictures one Sunday after church. Rachel, you did a great job with the photos as usual. Alabama people, check her out here! It's my mom's 58th birthday today!!! Mom, I hope you don't mind me sharing your age because you look AMAZING and I hope when I'm 58 I look just like you! I love you and Happy Birthday! Now it's your turn to share your Christmas card! Link up with Victoria and I and our special cohost, Kristin. 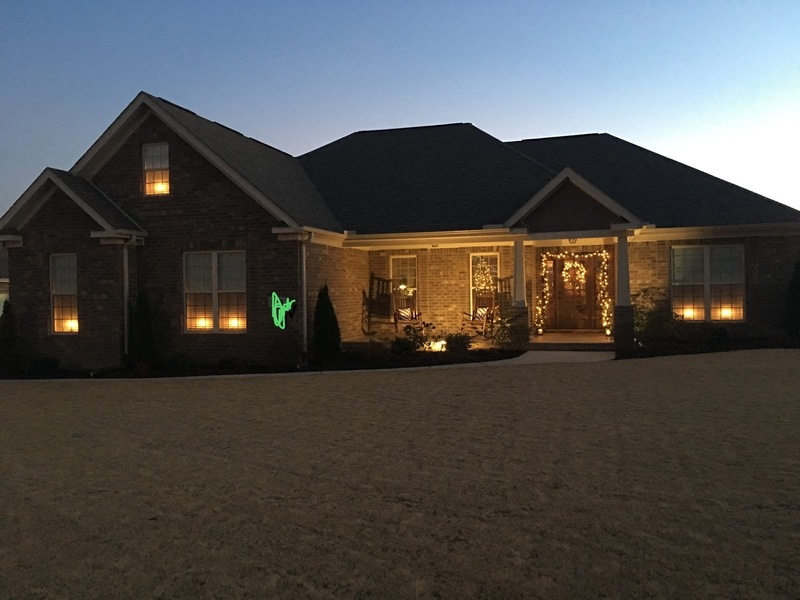 Come back tomorrow for a Christmas Home Tour--my FAVORITE!! Only a few more Fridays until Christmas!!! Part of my really wants to rush next week to get to Christmas break but the other part of me wants to cherish every moment--even if it involves exam reviews with seventh graders ha! Before I talk about my favorite things from this week, I wanted to mention yesterday's blog post. If you tried to comment or think you did, it didn't work because I messed up something with coding?? I know nothing about computers, so I have no idea what I did. BUT it's fixed now, so just know that if you did comment, I didn't get it so I can't reply back like I always do! And while we're on the topic of blog comments, I always reply back to the people who comment to me with an email. If you are a no-reply blogger (aka your email isn't connected to your account) then I can't email you back! If you comment and never get a reply, that's why! My sister came and ate lunch with me so duh, that's a huge favorite!!! Wrapping presents isn't a favorite, but a wrapped present is...if that makes sense! I had to wrap presents for my small group Christmas party so while I technically didn't really enjoy doing it, the final product was so satisfying! And speaking of my small group Christmas party, we had it at my house and it was a "Favorite Things" themed. Each girl brought 5 of the same gifts that were her favorite thing or related to her favorite thing that was only $5--that was the hard part! I found my gift on MAJOR sale on Black Friday so I gifted each girl with a Jesus Storybook Bible! We had a great time and I'm so glad to be in a small group with these girls. A Christmas Gift Guide FOR TEACHERS!! A Christmas Day in the Life!